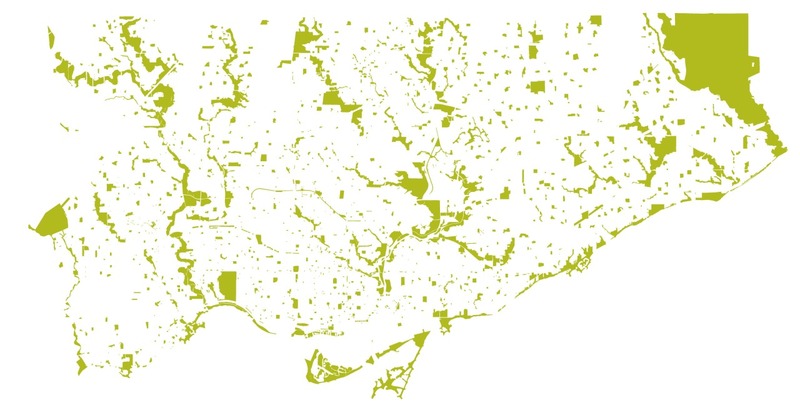 Toronto has 1,600 parks. Sometimes these are beautiful places of natural respite, places where you can imagine yourself far outside of the city. Other times they are filled with people and activities or fit snugly within a bustling neighbourhood. And then there are those parks that you likely walk by, maybe every day, maybe not even realizing it is a park. 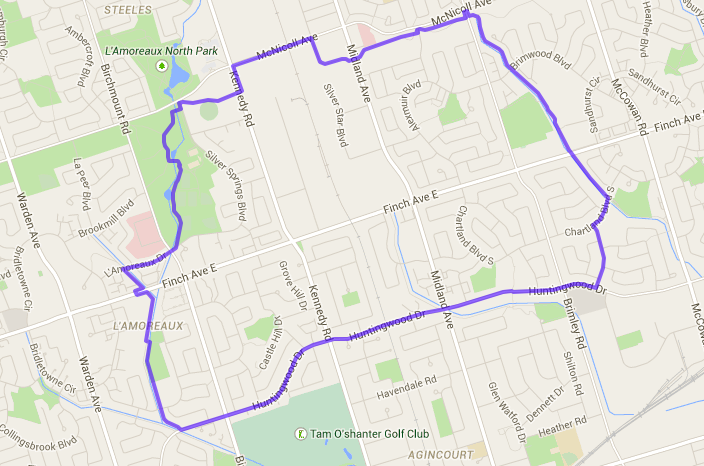 When deciding which park to visit next for my goal to visit a park I haven’t been to in every one of Toronto’s 44 wards, I took to Google Maps, flitting around Toronto until my eye caught a small triangular park hemmed in on all sides by multi-lane roads in the upper north-west corner of Ward 35 in Scarborough. 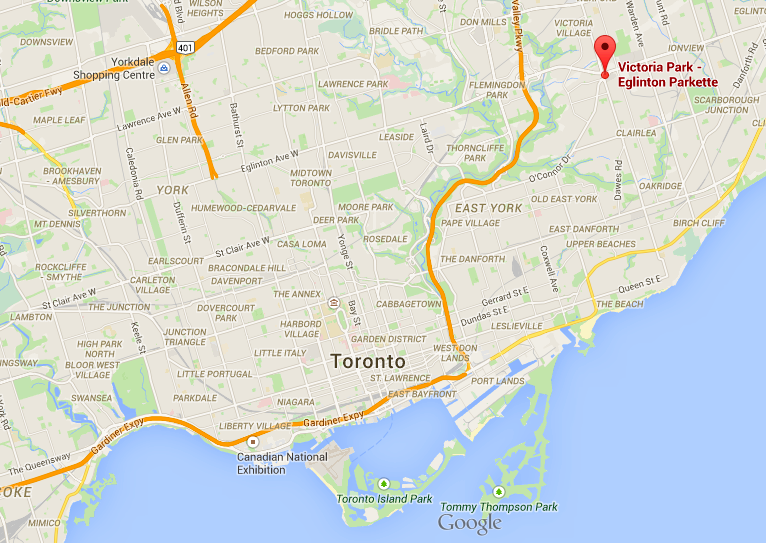 Victoria Park-Eglinton Parkette, it’s called. What is that like, I wondered. When I got there, the first thing I thought was: maps are deceiving. The park was actually far bigger than I expected. Despite being called a parkette, it was larger than some neighbourhood parks in downtown Toronto, like my home park, Jean Sibelius Square. That park has a small field, picnic tables, an adventure playground, a social space in its centre with benches and flower gardens, and a washroom building. 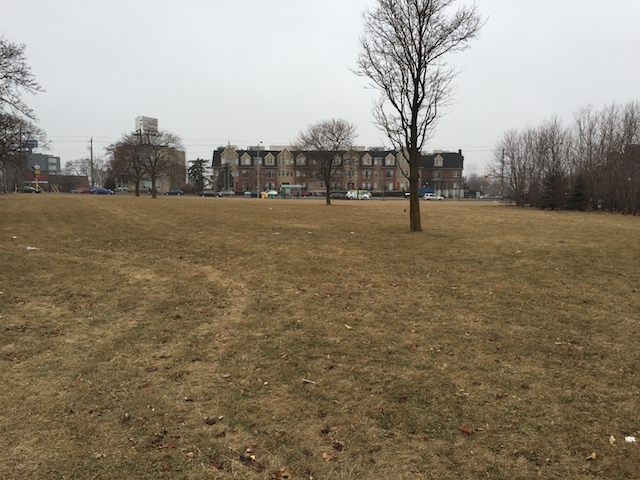 Victoria Park-Eglinton Parkette, in contrast, has…well, nothing really. It has a few trees, but the rest is flat grass and the only benches are the bus stops at its edges. There wasn’t even a park sign. When I came into work on Monday and showed my coworkers where I’d gone, they said, oh yeah, we know that park. There was someone from the community there that had proposed a new design a little while ago, they said. They put me in touch with him. Michael Kenny, a local resident of the area, told me over the phone that he’s seen this park untended his whole life. “It’s just been grass,” he said. However, Kenny, who is the Executive Director of an environmental organization run out of university campuses called Regenesis, saw more in the space. And a need for more animated community park space in the wider neighbourhood. Kenny had a team of student researchers “look at the space of the park and talk to residents to see what type of stuff they might want and what could fit in the space.” Some of the ideas, like an outdoor skating rink, probably wouldn’t have fit into the space. Other popular ideas were a space for a farmer’s market, adventure playground, community gardens, and an event stage for performances. When I asked whether people had expressed concern over safety issues because of the roads, he said they hadn’t really. “The space is used a lot to traverse between the mall and bus stops,” he said. “People are crossing it all the time.” In fact, there is a dirt pathway carved through the park that shows exactly where people have gone, which they used to form the design of where actual pathways might go. It’s an interesting design, if a bit crowded. Some may lament the loss of the grassy, open space. And I still wonder about all those cars zooming around its edges. This is the second post in the City within a Park series, the first of which, Earl Bales Park, can be found here. Earl Bales Park is one I’d heard a lot about in the last year, but had never actually seen myself. That is, until I took the 35 minute transit trip from my apartment to the park in Ward 10 as the first in my goal to visit a park I haven’t been to yet in each of Toronto’s 44 wards this year. 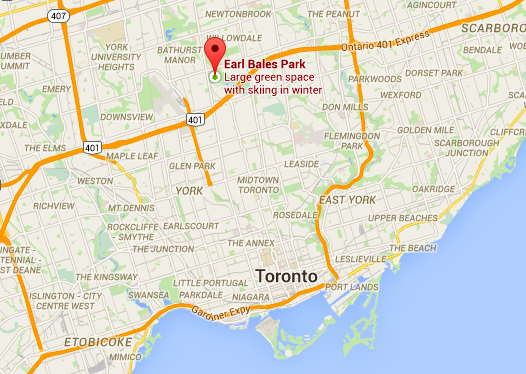 The reason I’d heard a lot about Earl Bales is because my coworkers at Toronto Park People have worked with several partners in the park, including the volunteer-run Friends of Earl Bales Park. Angie Buado from the Friends was lovely enough to meet me at the park’s community centre and take me on a little tour. I knew the park was going to be big, but I was surprised by how big. There was a lot to see and I only really explored the top half. Earl Bales has a bunch of unique features that make it pretty different than other parks in Toronto. One is the small rolling hills of the park itself, which are a remnant of when it used to be a golf course. This gives it a very pleasant, country-ish feel. If I owned sheep I would bring them here to graze. But even before it was a golf course it was a farm owned by John Bales, the great-grandfather of a former mayor of North York, Robert Earl Bales who the park is named after (the City has a nice little history on its website). One of the things that Angie showed me was the old farmhouse in the park, which is pretty cool, if in need of a little TLC. At least a bird had made its home in one of the windows. Aside from all this, there are two other things that make this park different. One is the ski hill and the other is the amphitheatre. 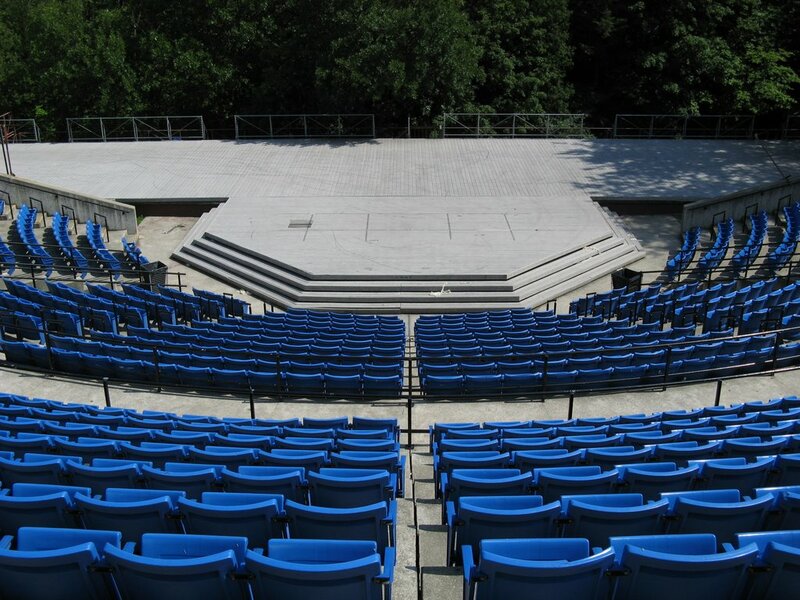 When I heard there was an amphitheatre at Earl Bales I thought maybe it meant just a bandshell set amidst some grass, but no: it’s an actual amphitheatre with a nice stage and stadium-style seating. Angie told me the Friends of Earl Bales help organize music performances there, which would be great. The ski hill was something I already knew about, but was surprised to see how much of an operation it was. While the rest of the park was fairly empty on this cold January day, the hill was buzzing with people in brightly coloured jackets and pants who were way too excited to hurtle themselves down a slippery slope on what basically amounts to two skinny sleds strapped to their feet (I don’t ski). 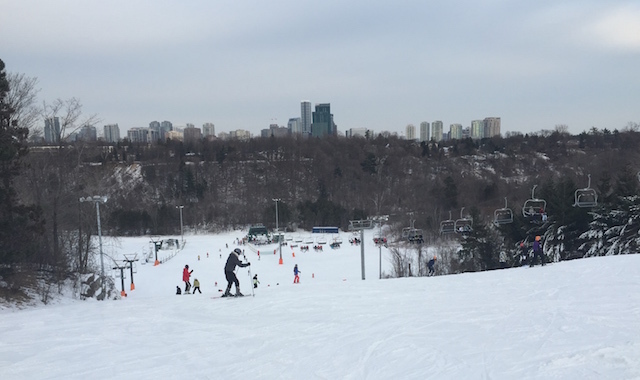 I just appreciated the nice view of the Yonge skyline in the distance and the strange but charming view of a ski chairlift in the middle of the city. I would come back and ride it in the summer if they kept it open, like a very slow amusement park ride (related note: a zip-line was once proposed for the park!). Earl Bales is also part of the western branch of the Don ravine system, so there are some lovely trails and connections to other nearby parks. It’s interesting to stand in the park and realize it’s part of a system that connects all the way down to the waterfront and has branches that flow off into other parts of the city–something I’ve written about before. I walked a little ways down a trail that went around the bottom of the ski hill where there is a nice off-leash dog area and a little river where a bit of rushing water could be seen through spots in the ice. If my toes hadn’t turned into complete ice cubes by this point, I would have continued on walking. I’ll definitely be back. Perhaps to take in a show at the amphitheatre in the summer or just lay on one of the lovely little hills and read a book. My coworker Kyle Baptista shared these cool hexagon-style maps of Toronto on Friday. According to BlogTO, they’re created by Willian Davis. 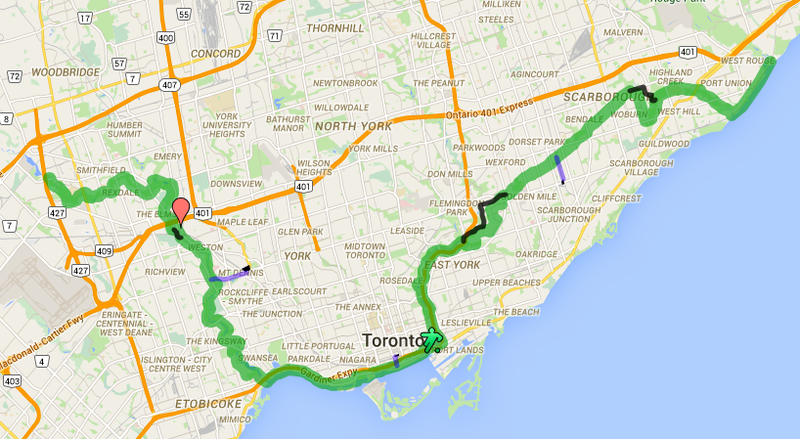 The two I have here are parkland and addresses, but there is also TTC stops and schools. What’s interesting about these two maps is that the addresses map is actually a better representation of parkland in the city than the parkland map. 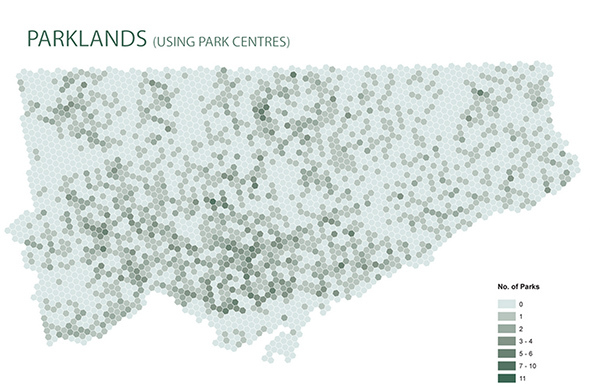 The parkland map uses number of parks to create its density of colours and so you end up seeing darker colours in areas of the city with a lot of parks, even if those are small parks, and lighter colours in areas where you have a lot of parkland in one big park, like Rouge Park. The addresses map, however, shows the city’s parks and ravine system in a kind of reverse way. 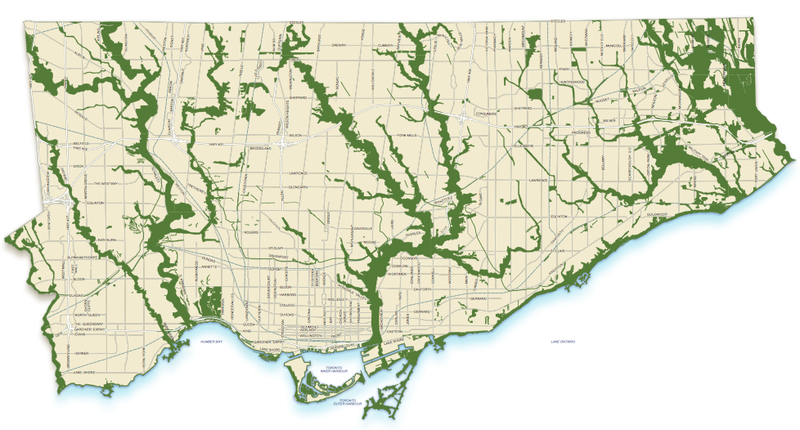 If you focus on the lighter areas–the areas where there are less or no addresses–you can see the system of ravines and some of the larger parks, like High Park. Lately there has been a lot of ink devoted to Toronto as a divided city and what to do about it. There have been great suggestions about reforming our political system for more locally-based decision making and building much needed transportation connections. But for me—surprise—it’s our park system that is the most able to bridge divides and forge a city identity, representing both the diversity of our city and its interconnectedness. Each park is a great representation of local community, but it’s all tied together into a larger system. The trick for a city as big and diverse as Toronto, I think, is figuring out how to nurture a sense of local place while at the same time plugging that into an understanding of connection at a larger, citywide scale. As the Toronto Star’s Divided City series has pointed out, part of the solution to the divided city must be a recognition of the need for local agency. Diversity our strength is our city motto, and so we should reflect that in our politics, policies, and planning. But how to forge unity from difference? This reminded me of something that Thomas Bender wrote in a book about New York called The Unfinished City. He argues that in order to forge a metropolitan identity out of “a plurality of local publics” a city “requires an image of itself.” In his mind, these images are rooted in infrastructure, transportation and the environment, because they reveal our interdependence but have local impacts. Certainly transportation has been a part of the conversation here in Toronto, but it has tended to be one of division as we squabble over technology and who gets a fair share of the transit pie. For me, parks and open spaces are the perfect image of the city as both a regional and local being. And our system of ravines and hydro corridors are the large scale pieces that stitch those local elements together. Just zoom out on Google Maps a bit and this system is revealed—the ravines travelling north-south and connecting the northern parts of the city to the waterfront (see title image), and the hydro corridors travelling roughly east-west (see below). If we want to reveal interdependence and a sense of shared identity as a city, then what better way than to celebrate the life-giving properties of our shared watersheds and the energy-giving properties of our hydro corridors as public space? These spaces are both intensely local and just as intensely regional in their scale. Each of the parks along these systems have their own local character, but by presenting them as a larger connected system and building that narrative, these green corridors can become the visual representation of a city brought together through its local places. We have a few projects in Toronto that begin to fill in this image and create a larger identity from these connections, such as the North Scarborough Green Loop (pictured above), which was championed by a local resident and uses existing trails through parks, on-street connections, and part of the Finch hydro corridor. Also the master plan for a revitalized Lower Don Trail, and the overall trail system that is slowly being tied together through some of our hydro corridors and ravines. It’s the Pan Am Path, though, that best expresses the idea, using the diversity in our neighbourhood parks by plugging them into a cross-city vision. It’s a plan that is both local and citywide in its scale. Its appeal is in that narrative of connections and its celebration of Toronto’s neighbourhoods in all corners of the city. And it does this by using what we already have largely in place. So if we truly want to bring the city together by celebrating what makes Toronto so great—our diversity—then what better way than articulating a vision of a cross-city network of local parks? The bones of this system are already here; we just need to build on the connections. images: ravine map from Toronto’s Official Plan, hydro map from this Google Map someone made (I added in the Green Line hydro corridor above Dupont Street, though), Green Loop map from here, and Pan Am map from the Pan Am website.